For some people, the thought of getting hearing aids feels the same as the thought of long-gone adventures and spending all day on the rocking chair on the front porch yelling at the neighborhood kids. Hearing aids of today are extremely powerful and capable of helping people of all ages live fulfilled and active lifestyles. Getting hearing aids doesn’t mean giving up the things you may love – like hiking, traveling, or even flying. 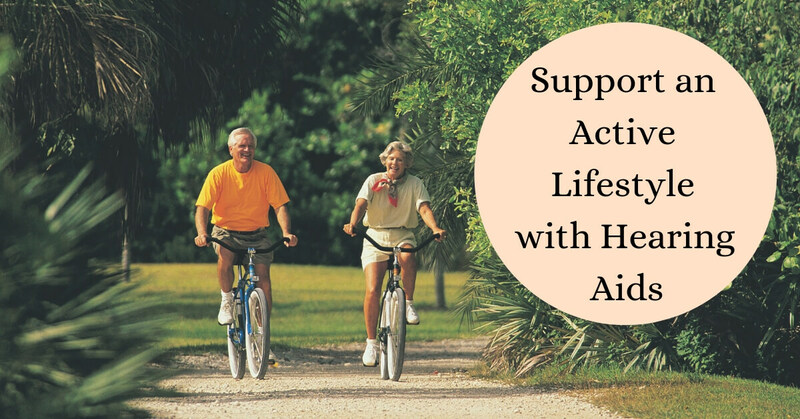 In fact, hearing aids can actually improve these activities, helping to make them more enjoyable and less stressful. If you lead an active lifestyle or plan on picking up an active hobby, it is important to discuss your hearing needs with us at Elite Hearing. When we work with you to treat hearing loss, we’ll keep your activities in mind when helping you choose the right hearing aid to meet your needs. Before choosing hearing aids for an active lifestyle, it is important to understand Ingress Protection or IP measures. Every hearing aid on the market (along with many other technological devices) are tested and given an IP measure. This two-digit number represents the device’s ability to resist dust and moisture. The first digit ranges from 1-7 and refers to resistance to dust and debris. The second digit, ranging from 1-9, indicates how resistant a device is to moisture. For example, a hearing aid with an IP of 67 is highly resistant to dust (a 6 on a 7-point scale) and also quite resistant to water and moisture (a 7 on a 9-point scale). This device has been tested to withstand being submerged in less than three feet of water for 30 minutes. Although an aid with an IP of 67 has been tested to withstand underwater submerging for 30 minutes, these are under perfect laboratory conditions in purified water, with brand-new aids. Hearing aid manufacturers recommend that wearers never fully submerge their aids under water. As of today, there are no fully waterproof hearing aids on the market. This does not mean that there aren’t options for those who enjoy sports near water: such as kayaking, fishing, paddle boarding or rafting. In fact, there are many hearing aids that score quite high on water resistance measures, making them good options for those who enjoy wetter wonderlands. For those who enjoy water sports, it is a good idea to look for a hearing aid with an IP67 or IP68 rating, such as the Oticon Opn or the Phonak Audéo Marvel. There are also accessories that can help protect hearing aids from moisture such as hearing aid covers and protective sweat bands. Whether your jam is camping, hiking, biking, or simply playing with the grandkids at the park, there are hearing aids to meet your needs. As mentioned above, it is important to find hearing aids that have a high IP rating to resist against the dust, debris, and moisture that are inevitable when partaking in activities outdoors. On top of resisting against dust and moisture, people who enjoy outdoors activities should also look for hearing aids that include wind resistance technology. Most modern hearing aids do employ effective wind resistant technologies, for example, the Widex UNIQUE aids and the Signia Pure series. If you prefer to keep active indoors in a gym or at fitness classes, there are hearing aids to meet your needs as well. Because you will be sweating, it is important to find a hearing aid with a solid water resistance measure, however, the dust and debris portion of the IP rating will be less important. Some fitness classes are equipped with hearing aid loops, which allow those with hearing aids to flip a switch and get the instructor’s voice streamed directly to their hearing aids. If this is not possible your gym, there are other options for better hearing your instructor. Most hearing aids are compatible with accessories such as a microphone that your instructor could clip on his or her shirt to allow her instructions to stream directly to your aids. However you choose to stay active, we support you! If you have questions about which hearing aids are the best match for your unique lifestyle and needs, please do not hesitate to reach out to our friendly team at Elite Hearing.